Achilles is a fun to play slots game with 5 reels and 20 playlines and also contains an interesting twist in its features. Produced by a group known for providing unique and user friendly games, Achilles have been produced with precision and such uniqueness that it always keeps the player glued to the reel as they anticipate that win. It is such interesting that it has been widely accepted by players all over the world. Similarly most casinos are now offering it since it has attained much of the player’s attention. Both the experienced and starting players can win equally since no actual experience is required for one to win big in this game. All you have to do is spin the reels and if you have a lucky hand, you hit a massive win. 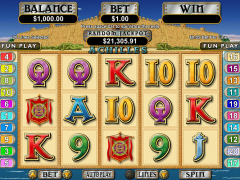 It is unique in that it has two types of scatter symbols as compared to most other slot games which mostly contain one scatter symbol. This is advantageous to the player since it adds him more chances to hit the bonus feature and also earn more. Achilles series slots are fun to play and you can still make money in the process. Similarly, there are wild symbols which could see you hit various options like multipliers in your winnings if hit. Furthermore, this game has the random jackpot which could make you an instant winner anytime. The wild symbol for this game is Achilles and it replaces any other symbol to form a winning combination. It replaces the scatter symbol too since itself is the scatter symbol as well. If you hit 3 or more Achilles anywhere on the Achilles Real series slot reels, you will trigger the feature bonus game. A number of Achilles will appear and if you click on any one of them, you will be given a number of free spins from 15 and if you are very lucky to hit the highest offering Achilles you will receive 25 free spins. This is very advantageous since you will be playing without actually using your money to run the reels. However, you will win just like you were spinning the reels on money and the winnings you make during the free spins will still be awarded to you as you could have been playing using your cash. However, during the free mode, all Troy symbols change into either Achilles or Helen symbols. In case you get a win or a prize during the free spins, they will all be tripled. The second scatter symbol other than the Achilles is the troy symbol. If you hit 3 or more troy symbols anywhere on the screen, you stand a chance to win 10 free spins and a 2x multiplier on every win you make. This feature could be retriggered anytime you hit 3 or more scattered Achilles or Troy symbols. The Achilles game is also made unique by its random jackpot which comes anytime anywhere during the regular spins. The Achilles random jackpot is one to look out for since it comes with an enormous prize. This game has a very high potential of winning not forgetting the excitement and intensity it provides. Its graphics are of very high quality and the spins are always fair thus your chances of winning are not limited by any favor to the house. The RTG Company ensures that it gives you the best software when playing this game so that no interference could make you lose or deny you a chance of winning. The ancient Troy theme in this game is appealing to the fans of both ancient history and those who have sweet anticipation of slots. Similarly, this game supports the autoplay function thus you don’t have to keep on spinning the reels individually, and when you want to try your hand’s luck you could opt out of the auto play and spin the reels yourself by pressing the start button. Achilles is a recommendable game and one to look out for.